The new findings from the "Ormos Valley" research project, at Lampayanas in southern Argolis, were announced by Greece's Ministry of Culture. The "Ormos Valley" program is conducted under the direction of the Ephorate of Underwater Antiquities with the collaboration of the University of Geneva, under the auspices of the Swiss Archaeological School in Greece. It aims at studying immersed prehistoric sites in a small bay of southern Argolis, near the well-known archaeological site of the Frachthi Cave. In 2015, a sufficiently large (at least 1.2 hectare) settlement of the Early Bronze Age was located in the sea area of Lampayanna Beach, north of the Bay. Some architectural remains are visible at the bottom, at 1-3 meters deep, while more could be buried beneath the marine sediments. From 2016, research has focused on exploring the extent and dating of the settlement. The 2017 survey commenced with submarine topography and geophysical measurements. Following the previous work at Lampagianna Beach, the bottom-view architectural remains were further mapped, and the electrical resistivity tomography continued to the north of the beach in shallow water. Preliminary results indicate the existence of more complex buildings, as well as many buried architectural remains. Submarine excavations followed on a larger surface than in 2016 and improved methods. Under the layer of Early Helladic II (in the 3rd millennium BC, to which the visible architectural remains correspond to the bottom) a wall of Early Helladic I (early 3rd millennium) was revealed. Another older mattress, which could be dated even during the transition period between the Neolithic and the Early Bronze Age, was also investigated. The findings include large amounts of purple shells. However, it is still impossible to determine what they were used for. 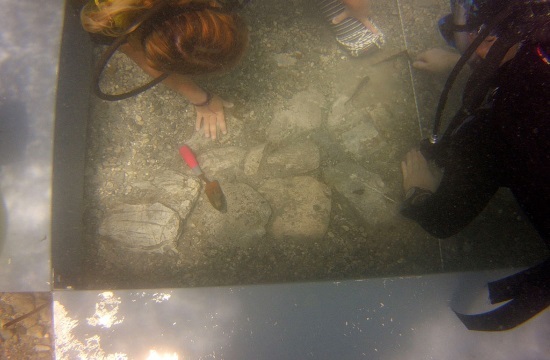 The 2017 excavation, which ran from 3 July to 11 August, was carried out under the responsibility of Dr. Angeliki Simosi, Director of Underwater Antiquities, and Professor Karl Reber, Director of the Swiss Archaeological School in Greece.